Use for birthdays, get well, thank you, good luck, sympathy, friendship, Mother's Day, congratulations, and for flower and tea lovers. Also includes a topper or postcard. And the little tea packet makes a nice card-n-gift item. Have just downloaded the blue and white porcelain teacup set for some upcoming gal pal birthdays. I think it's your most beautiful set yet, and I love that you created it in honor of your mother (whose taste seems to be simpatico with mine!). In those rare moments that I have for crafting, I turn most often to my library of your wonderful designs to create something unique and beautiful with my hands. I designed this shaped cradle card for my Mother who is a lover of both tea and blue porcelain. It includes my existing blue teacup card and flowers from two birth flower months. The blue tones are less saturated (than in the original card) and flower colours were adapted to go with my Mom's furnishings. 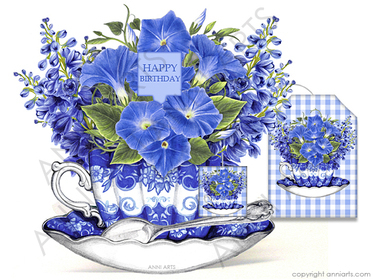 The antique cup I have is a vivid cobalt blue, but I softened the hue for this card. She loved the card, so I thought I would share it here as well. It is an all-occasion card suitable for many occasions and themes, including birthdays, get well, thank you, good luck, sympathy, friendship, Mother's Day, congratulations, flower lover, tea lover and more. I include a card topper on a gingham background for those who don't feel like cutting around the shaped cradle card! Multi- message patches and labels are included, as well as blank ones.